Using alignment rods in the proper places can really aid your practice time. You’ve heard the old saying, “How do you get to Carnegie Hall – practice, practice and more practice!” The same can be said for your golf game as the only way to truly get better is through working on your game. But knowing how to practice is just as important as committing to it. It has always troubled me how many golfers I see hitting balls at the range as fast as possible without any purpose. At the end of the day this type of practice will get you lose and that’s about it. If you want to make your practice more quality and ingrain better habits, practice with a purpose in mind. Simply start with this type of practice station the next time you go to the range (please see photos). To begin with, put a few alignment rods or shafts on the ground to determine your target and ball position. Here you’re just making sure that your feet, hips and shoulders are all in line or parallel to your target line. The yellow rod in the image shown is for ball position. Your ball position will be determined by the club you’re using. You want it forward or closer to your left foot for longer clubs and middle to slightly forward for the middle and short irons. Your focus now with the orange target rods down on the ground is to train your eyes where you think you’re aiming. As an example, let’s say your habit is to constantly aim right. When using the alignment rods, take your stance and look up at your target, you should feel like you’re aiming way left of your target. You now need to trust where the target rods because you are controlling where they point. Now with the ball position rod your focus is to not only determine where you need to position each club in your stance, but it’s also a great way to see if the clubface is square to the target in the address position. You simply want to make the leading edge an extension of the rod so it’s 90 degrees to the target. This is a great way to train your eyes and learn how to trust where the clubface is aiming. Once you have a better feel of where your aiming you can try the directional rod drill (highlighted in top photo). Stick an alignment rod in the ground standing straight up about 20 yards down your target line. Your goal here is where you want the ball to start. If you want to draw the ball make sure you start the ball right of the stick and if you want to fade the ball start the ball on the left side. This drill gives you multiple things. First it gives you the visual you will need to shape shots as well as block out one side of the golf course. Plus, it makes practice much more fun mixing up the different ball flights. 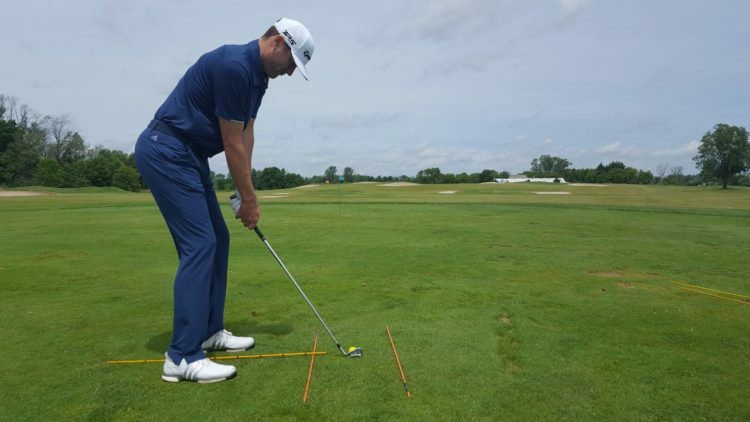 If you have never used the alignment rods when practicing do yourself a favor and try them. It will make your practice much more quality as well as bring consistency to your overall setup. Andy Podolak is the Head PGA Golf Professional at Fire Ridge Golf Club in Grafton, Wisconsin. Andy is currently in his 10th year and before his days at Fire Ridge he played professionally on NGA/Hooters, Various Mini Tours and many Nationwide/ PGA Tour qualifiers. Andy’s lesson rates start at $45 per half hour or $75 per hour session. Various lesson packages are also available and he can be reached at Fire Ridge GC by calling 262-375-2252 or via email at apodolak@fireridgegc.com. Also visit Andy’s facebook page at Podolak Golf Instruction. Andy Podolak is the Head PGA Golf Professional at Fire Ridge Golf Club in Grafton, Wisconsin. Andy is currently in his 9th year and before his days at Fire Ridge he played professionally on NGA/Hooters, Various Mini Tours and many Nationwide/ PGA Tour qualifiers. Andy’s lesson rates start at $45 per half hour or $75 per hour session. Various lesson packages are also available and he can be reached at Fire Ridge GC by calling 262-375-2252 or via email at apodolak@fireridgegc.com. Also visit Andy’s facebook page at Podolak Golf Instruction.